05/05/2018 - Spring Meeting - New Location! - May 5, 2018 Starts at 9a.m. 02/24/2018 - Heading Into Our 9th Year! 01/07/2016 - New Year's Resolution: Even More Fun! 08/28/2015 - State Fair Time Update! 04/03/2015 - Two Spring 2015 Events! 07/04/2014 - We love a parade! 05/31/2014 - Woodticks Are Riding! 03/10/2014 - ATV Trails Open In 60 Days! 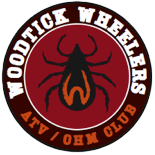 10/20/2013 - Woodtick Wheelers Named "Club Of The Year"
04/23/2013 - Spring Meeting & Breakfast This Weekend!